Washington Post Avi Loeb poses in the observatory near his office in Cambridge, Mass. His theory about an alien spaceship has made the rounds in the media and caused controversy in the academic community. CAMBRIDGE, Mass. 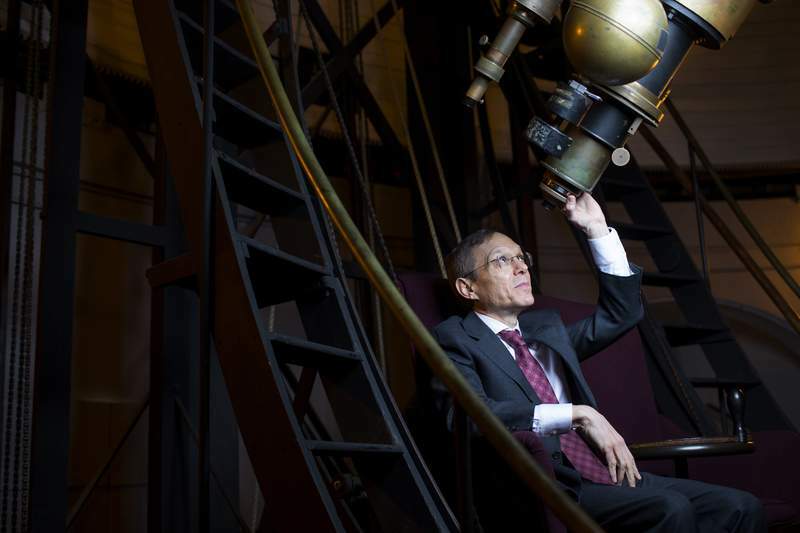 – Before he started the whole alien spaceship thing last year, the chairman of Harvard University's astronomy department was known for public lectures on modesty. Personal modesty, which Avi Loeb said he learned growing up on a farm. And what Loeb calls “cosmic modesty” – the idea that it's arrogant to assume we are alone in the universe, or even a particularly special species. You can find a poster for one of these lectures in Loeb's office, though it's a bit lost among the clutter: photos of Loeb posing under the dome of Harvard's enormous 19th-century telescope; thank-you notes from elementary schoolchildren; a framed interview he gave the New York Times in 2014; his books on the formation of galaxies; his face, again and again – a bespectacled man in his mid-50s with a perpetually satisfied smile. “Oh, this is something I did last night,” Loeb says. It's a calculation, he explains, supporting his theory that an extraterrestrial spacecraft, or at least a piece of one, may at this moment be flying past the orbit of Jupiter. Since publishing his controversial paper, Loeb has run a nearly nonstop media circuit, embracing the celebrity that comes from being perhaps the most academically distinguished E.T. enthusiast of his time – the top Harvard astronomer who suspects technology from another solar system just showed up at our door. And this, in turn, has left some of his peers nonplused – grumbling at what they see as a flimsy theory or bewildered as to why Harvard's top astronomer won't shut up about aliens. What you can't call Loeb is a crank. When astronomers in Hawaii stumbled across the first known interstellar object in late 2017 – a blip of light moving so fast past the sun that it could only have come from another star – Loeb had three decades of Ivy League professorship and hundreds of astronomical publications on his résumé, mostly to do with the nature of black holes and early galaxies and other subjects far from any tabloid shelf. So when seemingly every astronomer on the planet was trying to figure out how the interstellar object (dubbed 'Oumuamua, Hawaiian for “scout”) got to our remote patch of Milky Way, Loeb's extraordinarily confident suggestion that it probably came from another civilization could not be easily dismissed. “Considering an artificial origin, one possibility is that 'Oumuamua” – pronounced Oh-mooah-mooah – “is a lightsail, floating in interstellar space as a debris from an advanced technological equipment,” Loeb wrote with his colleague Shmuel Bialy in Astrophysical Journal Letters in November – thrilling E.T. enthusiasts and upsetting the fragile orbits of space academia. “'Oumuamua is not an alien spaceship, and the authors of the paper insult honest scientific inquiry to even suggest it,” tweeted Paul Sutter, an astrophysicist at Ohio State University, shortly after the paper published. “A shocking example of sensationalist, ill-motivated science,” theoretical astrophysicist Ethan Siegel wrote in Forbes. North Carolina State University astrophysicist Katie Mack suggested Loeb was trolling for publicity. “Sometimes you write a paper about something that you don't believe to be true at all, just for the purpose of putting out there,” she told the Verge. Most scientists assume 'Oumuamua is some sort of rock, be it an asteroid ejected from some star in meltdown hundreds of millions of years ago, or an icy comet wandering the interstellar void. But it's moving too fast for an inert rock, Loeb points out – zooming away from the sun as if something is pushing it. And if it's a comet spewing jets of steam, the limited observations astronomers made of it showed no sign. Loeb argues that 'Oumuamua's behavior means it can't be, as is commonly imagined, a clump of rock shaped like a long potato, but rather an object that's very long and no more than 1 millimeter thick, perhaps like a kilometer-long obloid pancake – or a ship sail – so light and thin that sunlight is pushing it out of our solar system. And while he's not saying it's definitely aliens, he is saying he can't think of anything other than aliens that fits the data. In the meantime, he's doubling down, hosting a Reddit AMA on “how the discovery of alien life in space will transform our life,” and emailing “friends and colleagues” with updates on all the reporters who are speaking to him. “The mainstream approach (is) you can sort of drink your coffee in the morning and expect what you will find later on. It's a stable lifestyle, but for me it resembles more the lifestyle of a business person rather than scientists,” he says.